Who am I? How does God see me? 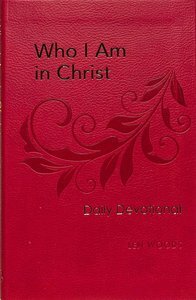 From forgiven and redeemed to chosen and victorious, the Who I am in Christ Daily Devotional will refresh you in God's presence as you deepen your understanding of how God sees you and what it means to be a new creation in Christ. Experience the joy that comes from daily realising that your identity is based on what God has done through his Son, Jesus Christ! You can live with confidence, assurance, and hope because you have a new identity in Christ. Includes 100 daily readings, Scripture, and prayer.Sample devotional topics:1. Trouble: Wondering Who We Are* Who Am I? * Running from Who We Are* Why Identity Matters* Identity Theft* Do You Want to Get Well? About "Who I Am in Christ Daily Devotional: 100 Daily Devotions"
For much of his adult life, Len Woods has been involved in student ministry. He's been a wild-eyed summer intern, a clueless part-time youth director, and a mistake-making full-time student pastor. He's been a bumbling adult volunteer as well as a stumbling father of teenage sons. The former editor of Youthwalk, Len has also authored and helped create numerous books and Bible study materials for youth and youth leaders. A graduate of LSU and Dallas Theological Seminary, Len is now the lead pastor at Christ Community Church in Ruston, Louisana, where he still goofs up on a regular basis.